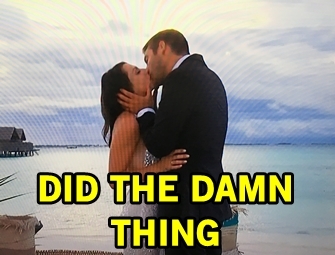 Becca and her final 2 are off to the Maldives for their final destination because it's the perfect place to declare your love for one and shatter the soul of another. Her family gets a free vacation to meet the two met and give their opinions on two guys they have like an hour to meet. First up is Garrett who shares the Kufrin love of fishing, explains his divorce to a new crowd, gets emotional over his family, and is extremely teary-eye talking about his love for Becca. The family loves him because he loves Becca so much. Blake's coming in from behind and the family seems to put him on the defense, as he tries to explain his love for Becca and "strong, independent women" and gets deflated when Becca's mom tells him if he gets dumped he'll be OK. When Becca is a little weird with Blake when he leaves, he's getting some bad vibes that remind him of his ex. Becca is extremely torn because her heart initially was all-in on Blake (who will balance and challenge her) but her feelings for Garrett (who they think would be a good dad) have intensified over time. Becca has her final dates with both men, trying to suss out where her heart lies. Becca and Garrett take to the sea to ogle majestic dolphins, then get verklempt about Becca's deceased dad, who would like Garrett because of fly-fishing. Garrett just wants Becca to be happy at the end, but especially if she wants to have a family with him because dude wants kids real bad. Becca and Blake ride bikes and paddle board, then talk about that downer of a family visit which apparently went better than portrayed to Blake's face. Blake busts out a craft project of love: a time capsule of their time together. Hmmm, no craft from Garrett - way to care. But will a craft project be a deciding factor? I mean it should, but I love crafts. It's proposal day! Neil Lane brings his briefcase of diamonds all the way to the Maldives and he only has one button undone on his shirt, so he's really grown over the years. Becca puts on one last horrible dress that looks like a macrame swan mermaid. It's off to the proposal dock beautifully constructed for the picture-perfect proposal... and ultimate heartbreak. Speaking of, Blake is up first so that's pretty bad news. 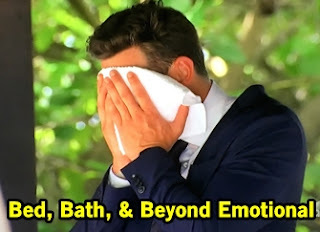 Blake begins his speech about all their happy moments but Becca's suppressed smiles should show something is off, and his extreme sweating is definitely an indicator of the nerves. Becca compliments Blake on giving her proof she could love again, except it's with someone else. Blake can't believe it, wonders what he did wrong, sweats a hell of a lot more, says I love you, and leaves to cry into a towel. And cut to the After the Final Rose where Chris Harrison questions Blake about this devastating day of his life. Blake has no hard feelings and can't be angry with her for doing what makes her happy. 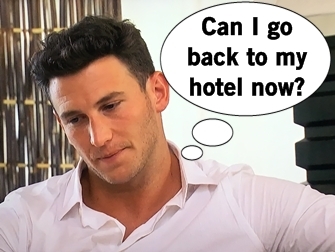 Becca and Blake are reunited and he still wonders what triggered her decision (answer: nothing, she needed to choose who was the better fit for her future). But this heartbreak won't bring Blake down and he'll learn and grow. It's him using his poetic words for his Bachelor campaign. Oh but remember there's supposed to be a happy ending on this show, so back to the proposin'! Garrett heads to the proposal spot and this time when he shares the happy stories and reasons he loves Becca she's actually smiling. And she shares feelings back and if you recall Garrett got the first impression rose, much like most Bachelorette winners. Garrett gets down on one knee with the giant three stone engagement ring to represent his divorced past, present and future with Becca. Last rose for Becca! The happy couple come onstage to After the Final Rose and are excited to finally be public with their relationship and the hideous ring. Becca's felt Garrett was the one at hometown dates, which is the same time it sealed the deal for him. Garrett stands by his apology, which is important phrasing, and says he's trying to grow but also doesn't say what he liked was wrong. Becca stands by Garrett in all of this. They look foward to doing normal things like going to Costco, getting a free trip to Thailand, and the minvan from night one. Well another season over and all I can say is: bring on Paradise!! Thank you all for reading my recaps each week and tweeting along. To quote the second worst Bachelor ever: I LOVE THAT. That was the most face sweat I’ve ever seen a human produce in 4 minutes.